The Romans ignored it in favor of Chester on the nearby River Dee, and the Danes passed it by more than a thousand years ago. 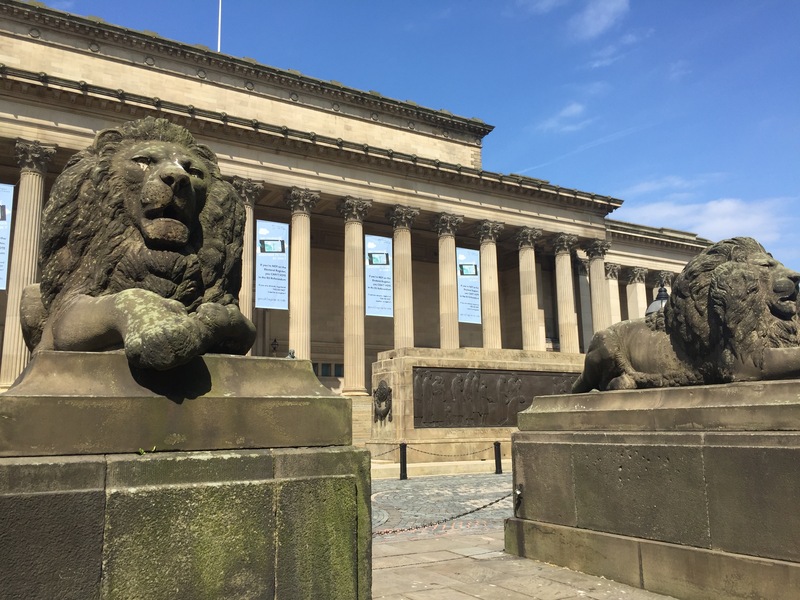 Those seafaring explorers, invaders and settlers left their names on nearby villages that have survived to the present time, but of Liverpool itself there is nothing tangible in ancient history. Indeed, the great port city of the future was still only a collection of huts at the time of the Norman Conquest in the 11th century, and Liverpool’s real birth can more confidently be set 800 years ago when King John granted it a charter in 1207. 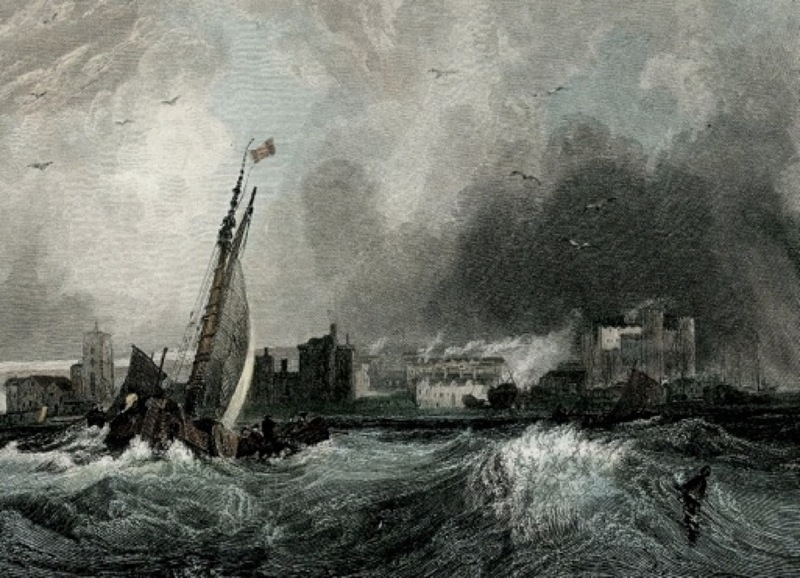 Above: A stormy Liverpool in 1664, from an original antiquarian print, drawn by S. Austin, engraved by E. Finden, published 1836. Collection of Michael and Catherine Otterson. THERE HAS LONG BEEN DEBATE on the origin of the name of Liverpool. There is not much doubt about the “pool.” A pool or inlet from the wide river Mersey provided a haven for small boats and later for larger vessels right up until the 19th century, when encroaching development caused it to be filled in. “Liver” also appears in very old documents as “Lither,” “Lider” and “Lithe,” which may be derivatives from the old Gothic “Lithe” or “Lide” meaning “the sea.” Thus, “Pool by the Sea” is a reasonable interpretation, though there are many other theories as to how Liverpool got its name. 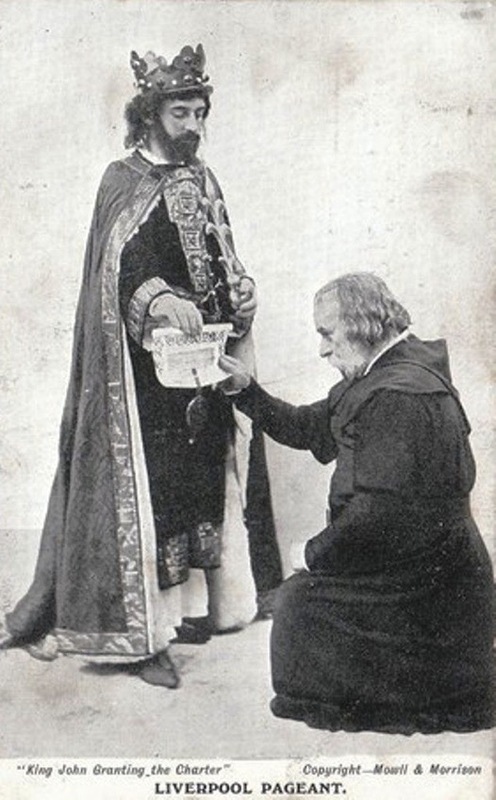 Witness - Simon de Paterskill at Winchester the 28th day of August in the 9th year of our reign (1207). 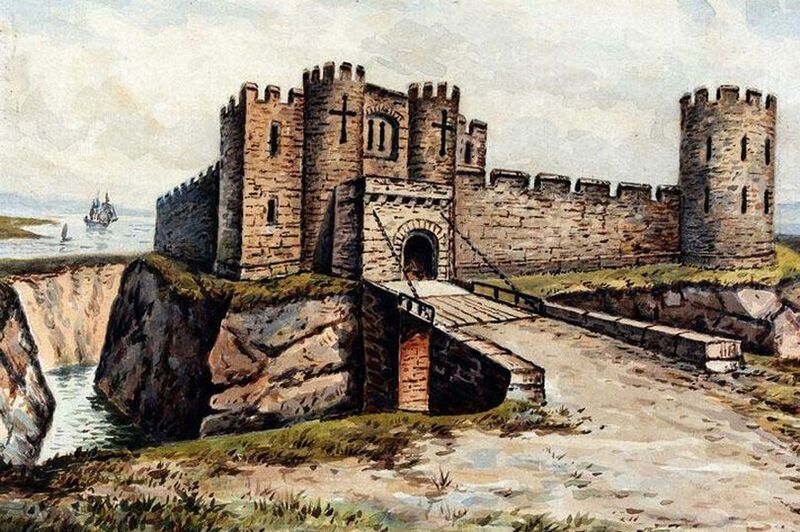 In recognition of its value as a port, a castle was built in Liverpool after the granting of a charter in order to provide protection for its people and assets. The building of the castle stimulated settlement, and the town is mentioned periodically in old documents, though never flatteringly. By the 1500s the population was still only 700, but the reign of Queen Elizabeth I saw improvements to the quay and harbor. By the 1600s the town was important enough to figure in the English Civil War. Parliamentary forces drove the Royalists out of the castle where they had taken refuge, only to lose it again later when the Royalists returned with a substantial army. It cost the king 1,500 men, however, and their victory was short-lived. The castle fell again to a siege by Cromwell’s soldiers. When the Civil War was over and the monarchy was restored in later years, the castle was destroyed by order of Charles II - a seeming fit of pique that perhaps arose from anger at those inhabitants who had sided with the parliamentary forces. The road leading from the castle to what is now the Town Hall survives as Castle Street. 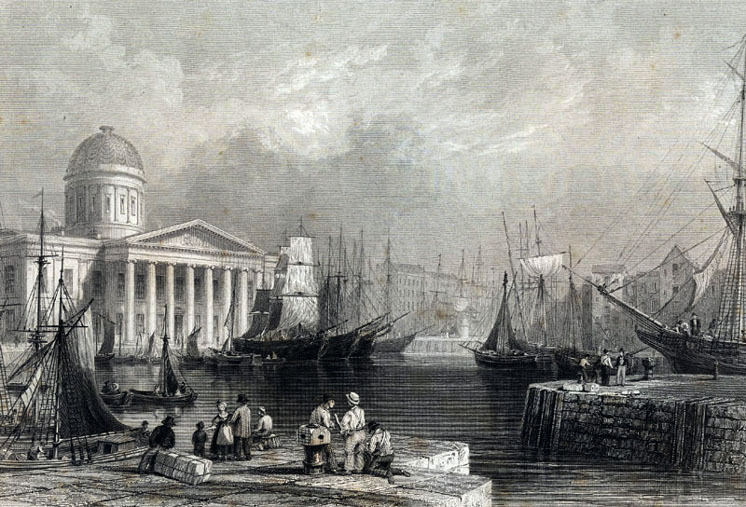 Not until the 1700s did Liverpool begin to show its promise as a significant port. At the beginning of the century the ships entering and leaving Liverpool were still mostly concerned with trade along the English, Scottish and Irish coasts, and with a few ports in northern Europe. But as docks were developed and facilities greatly improved, traffic increased. The first wet dock was developed at the old “Pool” in 1719, followed soon by other docks and a pier. It was accompanied by rapid development of commerce in the town. New canals were opening the port to the coal fields and manufactures of the interior. The population boomed: in 1700 there were just 5,714 people in Liverpool. By 1800 that number had risen to 75,000. Still, there was much that was still primitive. The first regular stage coach between Liverpool and London didn’t begin until 1760. It left once a week and took four days to complete the 180-mile journey. In the early part of the century there were few buildings of particular note, few named streets and fewer inns for travelers to stay. In the 1700s, much of that stimulus came from the discovery by Liverpool merchants of how lucrative the so-called African trade could be. By shipping manufactured goods to the west coast of Africa, trading them for slaves and shipping their miserable human cargo to the West Indies, they could earn a tidy profit which was further enhanced by bringing back rum, sugar and tobacco from the islands. This became known as the Triangular Trade. Ambitious merchants were only too happy to channel woolens from Manchester, metal goods from Sheffield and guns from Birmingham through the port, with no tinge of conscience as to the part their endeavors played in human suffering. 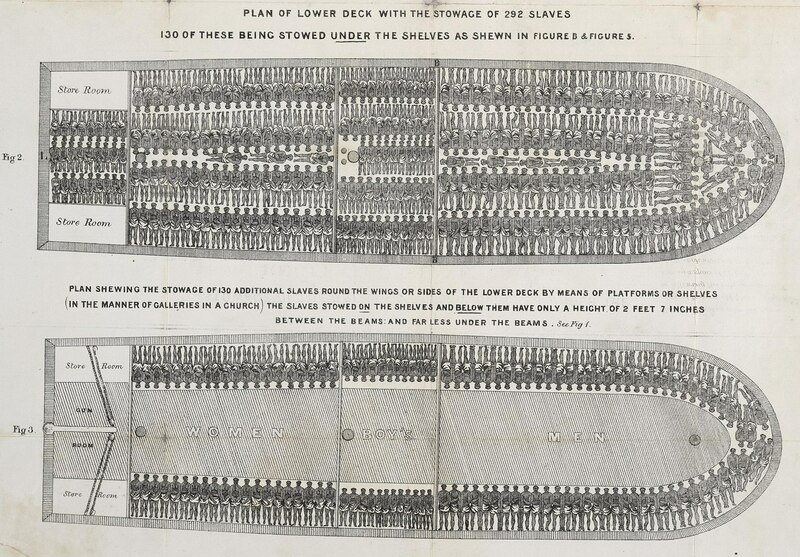 While slaves were not brought directly to Liverpool, such was the success of the triangular trade that Liverpool rapidly overtook Bristol as the premier port on the west coast of Britain. 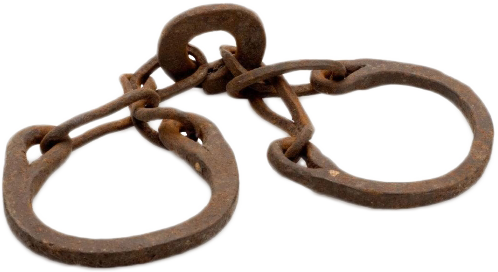 By the mid-1760s, more than half of the African trade was in the hands of Liverpool merchants, and at its height Liverpool interests would handle 40 per cent of all slaves from Europe across the Atlantic. Some estimates put the numbers much higher. Lord Street, about 1820. The spire belongs to St Peter's church, where most of the Berry family featured on this site were christened. Monument in Liverpool to those who died in the Irish Potato Famine. 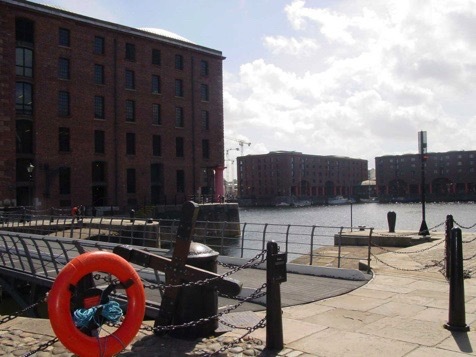 The Albert Dock, formerly an important part of Liverpool’s massive dockland complex, fell into decline after World War II, but has since been restored as shops and museums. 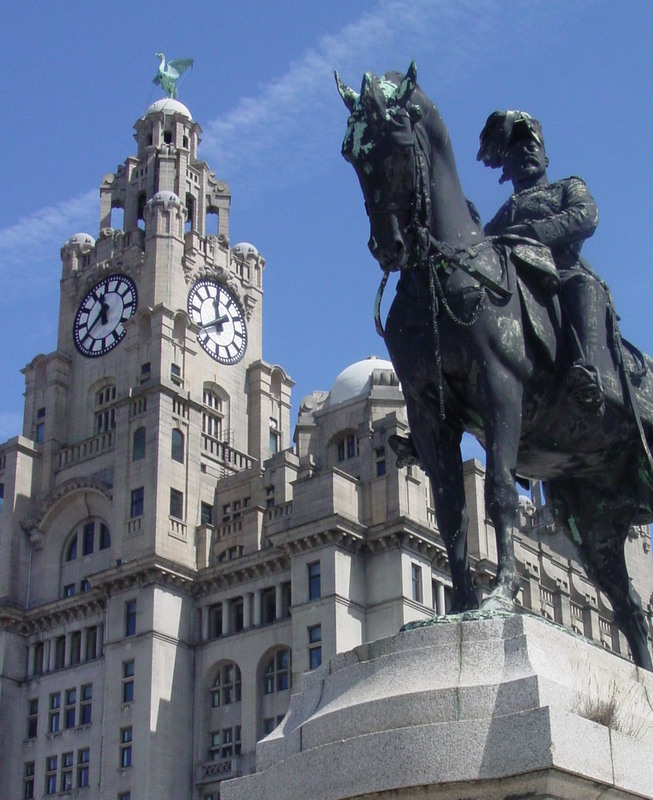 The Royal Liver Building looms behind a statue of King Edward VII at Liverpool’s Pier Head, now a World Heritage site. The building, completed in 1907, is the most prominent part of Liverpool’s skyline and the Liver Bird (pronounced Lye-ver) that tops it has become a symbol of the city. St George's Hall looms behind its imposing lions. It was in the 1800s that Liverpool was to reach its extraordinary apex as the greatest port in the world for shipping and tonnage of cargo. With trade to the East Indies and the Americas driving the economy of the port, it was perfectly positioned to take advantage of the introduction of steamers in 1815. By mid-century there were miles of newly constructed docks and wharves for handling every kind of cargo, and huge landing stages for passengers. Stately homes and buildings - including the magnificent Town Hall and St George’s Hall, graced the city, which spread to swallow neighboring villages that had once outranked it. The spires of dozens of churches added to the constantly changing skyline. Hotels and elegant shops thrived. In the census of 1851, Liverpool’s population was some 376,000. Ten years later it had added another 68,000, and by century’s end it leaped to 685,000. John Marius Wilson, writing for the Imperial Gazetteer of England and Wales in the late 1800s, wrote exultantly of this period: “[Liverpool] exhibits one of the most wonderful incidents of town aggrandizement which the world has ever seen. The commerce increased steadily but slowly, with corresponding increase of buildings and inhabitants, till the beginning of the last century; it increased thence, in a more rapid ratio, till the beginning of the present century; and it has increased thence till now with such prodigious rapidity and with such magnificent accompaniments, as to make its progress look like a work of enchantment." Wilson drew the line at elevating Liverpool above what in his mind were Britain's more beautiful cities, but nevertheless, wrote: "The town cannot for a moment compare with Edinburgh, Bath, Westminster, and some other cities, in squares, crescents, and other features of mingled spaciousness and grandeur; but it vies well with all these cities, and far excels many of the other large towns of Britain, in wide handsome streets, in neat substantial private dwellings, in large ornate shops and warehouses, and in sumptuous or magnificent public buildings. A continuous, broad, well paved road runs along the entire line of the docks, both within and beyond the borough boundaries, to a total length of fully 5 miles; very numerous streets strike from that road, mostly at right angles, toward the interior; a fair proportion of spacious main streets intersect the town in all directions, running through it like so many arteries; and the docks, the ferries, and the railway works and stations are all, in their own several ways, of a character great and striking." Wilson’s lengthy and detailed essay gives little attention to the poor, other than mentioning, almost as an aside, the charitable institutions that arose for the “support of decayed seamen of Liverpool, and of their widows and children,” as well as institutions for “receiving and reforming penitent prostitutes.” In fact, as in any large city, there were many who belonged to the poorer classes, and they congregated around the older parts of the city in housing that today would not be tolerated. But in the 1840s and early 1850s Liverpool had to deal with a huge and unexpected problem - the arrival of more than a million impoverished Irish immigrants fleeing from the Irish Potato Famine. These years were extremely significant in the history of Liverpool. The impact of hundreds of thousands of mostly Catholic Irish pouring into the city - more than half of them staying and the rest dispersing to other British cities or going on to America - is incalculable. It would quickly transform the religious mix of the city, and in time even the local accent would change under the influence of the Irish. Tens of thousands of immigrants lived in damp, crowded cellars near the dockland areas. Thousands suffered from fever and dysentery. The expanding port provided possibilities for unskilled labor, but it would be decades before many of these Irish immigrants could earn their living as skilled artisans or assimilate into the commercial world. It was around this period that some of the Irish families whose descendants would later connect with the Otterson lines entered Britain - the Hacketts, the Joyces, the Reeds and the Rileys. The Abernethys came in this period, too, probably through Liverpool, but moved beyond to settle on the eastern side of England. For more details on the experiences of these individual families and where they lived in Liverpool, see “The People” index and select the family name. 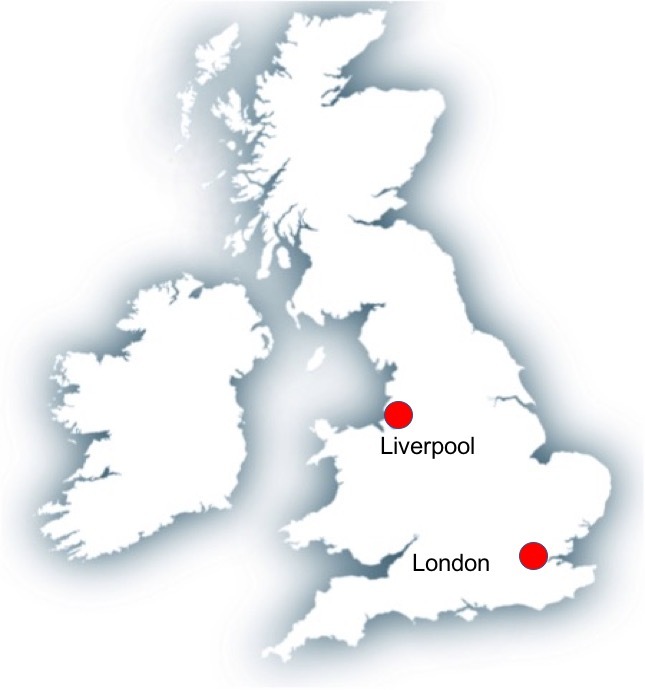 Liverpool continued to grow until it exceeded 800,000 people in 1937, shortly before the outbreak of World War II. The port area and much of the inner city was devastated by bombing during the war, followed by post-war economic decline, labor and social problems that plagued the city for several decades. Post-war, the population gradually declined to less than half what it had once been. Liverpool became synonymous with economic depression, chronic labor problems and militant politics. City planners in the 1960s, seemingly determined to rid Liverpool of its slums and substandard housing at any cost, ripped the heart out of cohesive communities and replaced them with high-rise apartment blocks and soulless housing estates. Only in the last decade or so of the 1900s were mistakes recognized and more enlightened policies pursued. t was in the 1960s that Liverpool took its place on the world stage for another reason: music. The Merseysound or Merseybeat echoed around the world, especially from the Beatles, but other groups contributed to a global dominance of rock'n roll that Americans dubbed "The British Invasion." Planners began to rebuild and refurbish the port areas, often preserving the city’s history while developing its infrastructure. As the century closed, the population increase finally exceeded the average growth in Britain and the future began to look brighter. In the 21st century, Liverpool has reclaimed the pride of its population as new development of hospitals, university buildings, new student housing, imaginative shopping malls and more attractive housing estates replaced blighted areas and created a promising future. 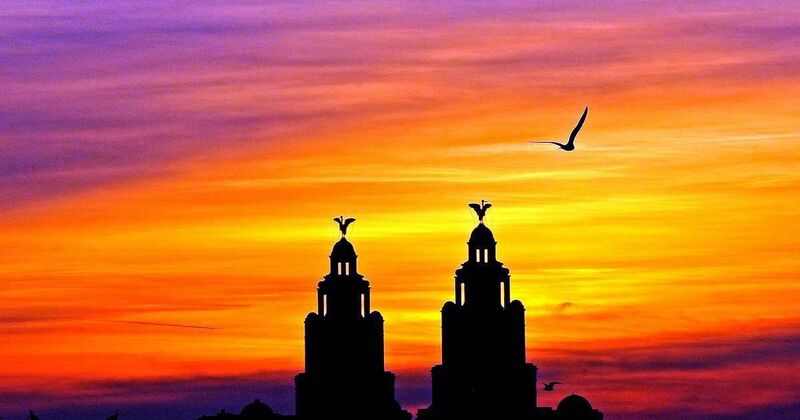 Below: One of a collection of stunning sunset photographs of the Liverpool skyline by Liverpool Echo photographers. The iconic Liver Building is a favorite subject for anyone with a camera in Liverpool.